One of the more popular stops on the Oregon side of the Gorge, the Horsetail Falls parking lot fills up quickly during the warm summer months, with people coming to enjoy this really great 4.5 mile hiking trail. If you enjoy hiking in the Columbia River Gorge, the route to Triple Falls will, without a doubt, suit your fancy. Along the way, you'll pass three stunning waterfalls, including one that you can actually walk behind, and you'll also catch glimpses of one of the most epically beautiful canyons in the nation, in Oneonta Gorge. In winter, licorice ferns sprout from the base of big leaf maple trees and lush mosses cling the trunks as well. Photographers are drawn to the infinite patterns of glassy spray created by the splash pool of Horsetail Falls. There are also trademark Columbia River Gorge views stretching across the river to Beacon Rock and beyond. Because it is one of the more popular stops on the Oregon side of the Gorge, the Horsetail Falls parking lot fills quickly during the warm summer months. Though the hike is indeed very popular, most of the people are there to take a picture or two of the roadside falls and move on. The trail itself is a moderate, out-and-back 4.4-mile hike that is even suitable for families. The waterfalls seen on this hike are some of the most beautiful so close to town. Horsetail Falls is right next to the road and drops a single, horsetail-like stream of water down 176 feet. When you get to Ponytail Falls, the sound of the highway drifts away and you view one of the beautiful waterfalls you will find in this area. You actually walk behind the falls, surrounded by volcanic rock and hear it thunder right in front of you. Triple Falls is the last stop on this hike and is where the creek flows down between bulges of rock, forcing the water to cascade to the creek floor in three different streams of water. For this hike, start from the Horsetail Falls trailhead and head up to the left on Horsetail Falls Trail #438 through some switchbacks past the junction for Gorge Trail #400. 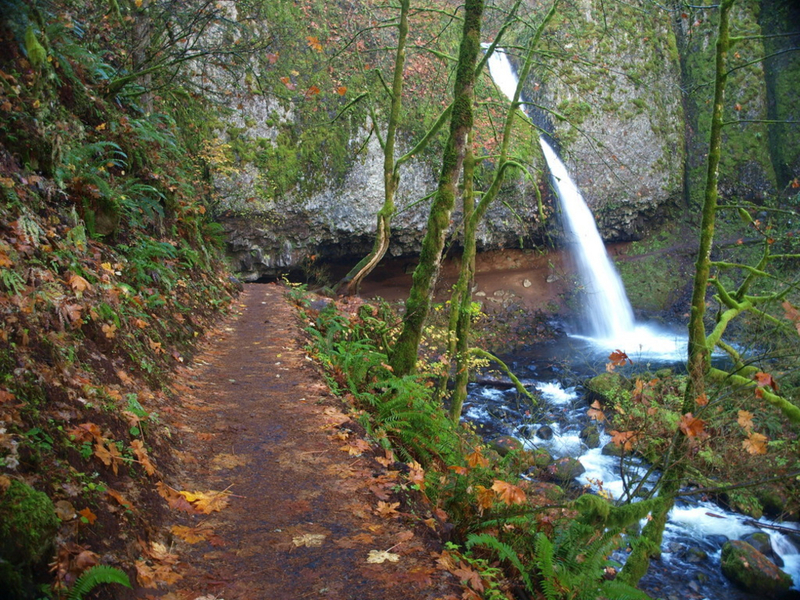 After about a half mile, you will get to Ponytail Falls (also labeled as Upper Horsetail Falls). The trail actually takes you behind the falls and continues past some beautiful viewpoints of the gorge to Oneonta Canyon, which you can see from a bridge at the base of Middle Oneonta Falls. From here you climb up through some switchbacks which lead you to eventually follow the creek from above until you reach a blind corner to the beautiful Triple Falls. For a delicious food and drink option, try The Multnomah Falls Lodge. Just down the Historic Highway, the Lodge at Multnomah Falls is your closest and best bet for food and drink. There's also a snack bar there if you want to do it on the cheap. This hike would be difficult to those new to hiking because of the steep switchbacks, but is fairly easy for intermediate or experienced hikers. The hike is totally worth the views of the incredibly beautiful waterfalls including the last stop at Triple Falls. To get to the Horsetail Falls Trailhead from Portland, drive east to I-84 to exit 28 for Bridal Veil. Drive east on the Historic Highway for 5.6 miles and the parking area will be on your left with the trailhead across the street.